This salad is excellent with grilled meat or just warm pita bread. Place the bulgur in a fine sieve and shake to remove dust. Dampen with cold water and let stand 15 to 30 minutes. Squeeze out excess moisture. In a skillet, sauté the onions in the oil until they become translucent. Remove from the heat to cool. 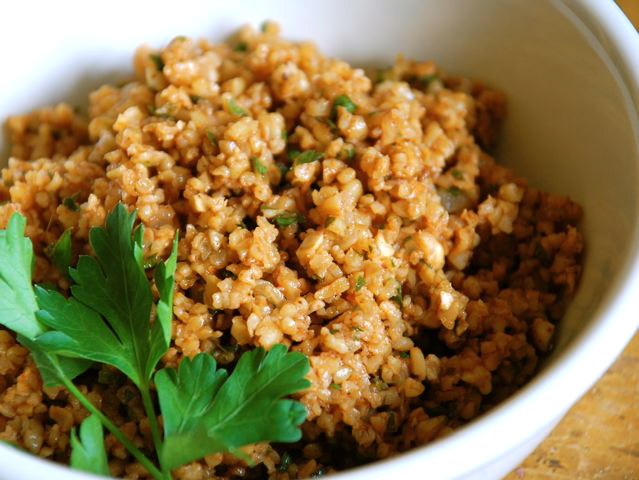 In a mixing bowl, combine the bulgur, onions, and all the remaining ingredients; blend well. Cover and refrigerate overnight. Serve chilled or at room temperature. Correct the seasoning with salt and pepper, and garnish with parsley sprigs, walnuts, and sautéed pine nuts. Culinate recipe editor's notes: When I made this, I cooked the onions a bit longer (until just beginning to brown), tripled the amount of pomegranate molasses, and substituted Spanish (smoked) paprika for the Aleppo pepper.